At Irish Heating and Air, we understand that your home needs to be at a comfortable living temperature. But what about when you’re at work or on vacation for a few days? 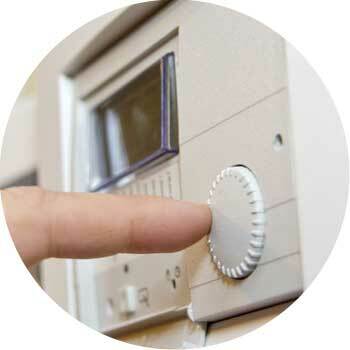 It’s important to be able to adjust the temperature of your home for various situations and times of the year. A thermostat will help save you money while keeping your home at the optimum temperature throughout the day – and the year. But which thermostat is right for you? There are several types of thermostats on the market, and we’re here to break down their differences for you. Basic Thermostats – these thermostats allow you to set the temperature of your home, but you cannot program them different temperatures throughout the day unless you manually change the temperature. This means that you either need to leave your thermostat off while you are away, or else waste money heating your room to a set temperature every day. Programmable Thermostats – with this type of thermostat, you can program your heater to turn on and off at specific times, or to heat to a higher or lower temperature depending on whether or not you are home or asleep. This is an excellent way to save money while still maintaining a comfortable temperature for your living space. Smart Thermostats – keep up with modern technology by investing in a smart thermostat or WiFi thermostat today. You can change the temperature setting of your thermostat via your phone, computer, or tablet. Forget to lower the temperature before you left for work this morning? No problem at all – just adjust the temperature setting via your phone while you’re at work. A smart thermostat is truly a cost-saving (and worry-saving) device. Our experienced technicians at Irish Heating and Air in Tracy will gladly help you upgrade your thermostat and help you choose the right model for your needs. Give us a call – we’re ready to improve your home today. 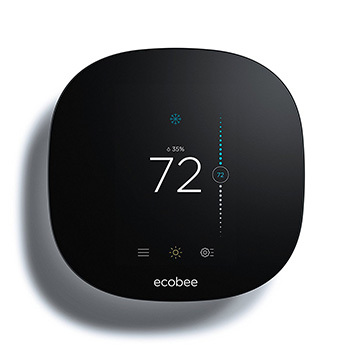 ecobee4 thermostats offer the ultimate in convenience in home connectivity. What makes the ecobee4 unique is that it comes with a built-in Amazon Alexa voice service so you can change the temperature, call a friend, or even order an Uber from across the room with no additional equipment. The ecobee4 also communicates with a wide variety of other internet of things devices, including Hue lighting, Kevo door locks, Nest cameras, and so much more. With an auxillary room sensor, this unit can also help you keep track of the environment in your living room, kitchen, bedroom, nursery, or any room that demands another level of control. ebobee3 lite thermostats offer next generation smart thermostat features at a reasonable price. The ecobee3 allows you to control your home climate from anywhere with the help of an easy to use smartphone app, available on Android and iOS. 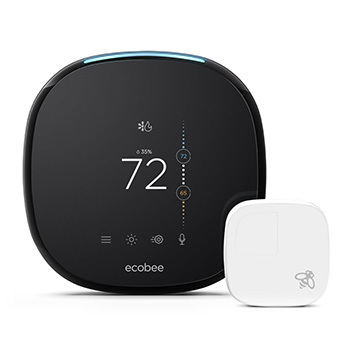 The ecobee line of thermostats also monitors local weather and tracks your schedule so no energy is wasted heating or cooling a room that doesn’t need it. Typical savings range up to 23% versus a traditional thermostat. If your furnace or cooling system isn’t turning on when it should, it could likely be that the thermostat needs servicing. Before you spend hundreds of dollars trying to fix your furnace, let our repairmen and women take a look at your thermostat first. It could be that the answer is simple and inexpensive. Our repair technicians at Irish Heating and Air can check your thermostat and perform necessary repairs as needed, or help you to purchase and install a new thermostat entirely. Call us today to schedule an inspection.